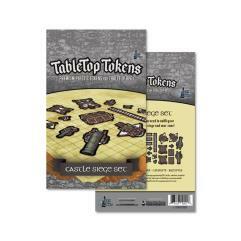 These tokens are sure to bring any tabletop RPG to life, with their beautiful, hand-drawn art and unlimited creative playing options. These tokens are crafted from a premium plastic material, making them durable, spill-proof and built to last for many adventures to come. Sized for a 1"x1" square battlemap. 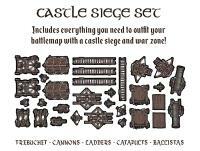 Over 30 unique tokens including trebuchet, cannons, ladders, catapults and ballistae; everything you need to outfit your battlemap with a castle siege and war zone.